It was exciting enough to be visiting New York in 2013 as a fully-fledged Garden Designer. So I was more than excited to have the opportunity to visit the High Line. If you’ve not heard of it before, it’s a public park of landscape designs, art installations and more … up in the air! It was created out of the remains of on an historic freight rail line elevated above the streets of Manhattan’s West Side. 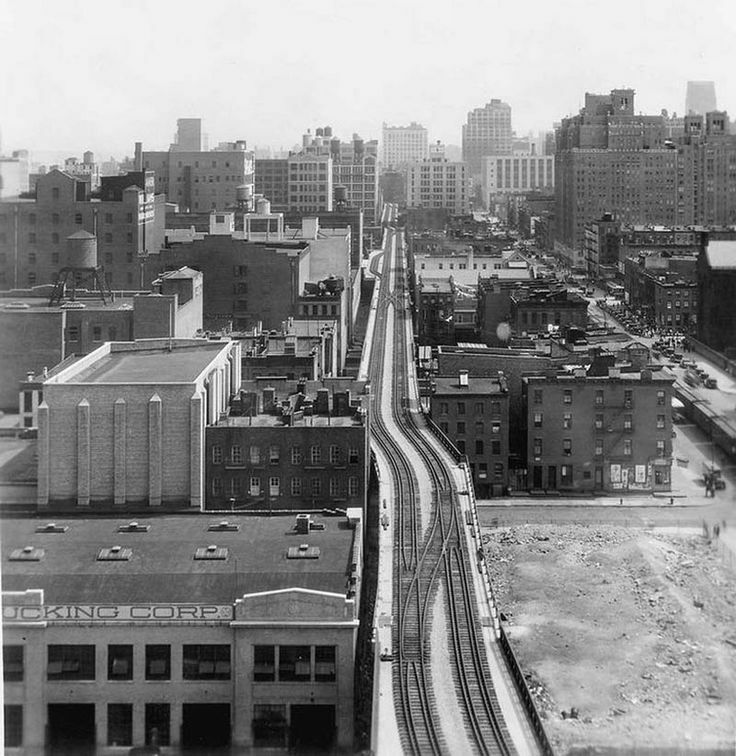 The High Line was only opened to the public in 2009, but it first opened in 1934 when it was used as a means to transport goods from 34th Street in lower Manhattan to St. John’s Park Terminal. 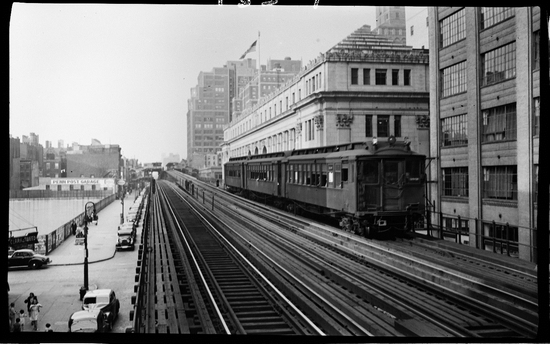 Its elevated train line ran through the center of blocks all the way up the west side of New York, carrying its last train of three car loads of frozen turkeys in 1980. At that time, the real estate owners were lobbying for demolition. Luckily, one resident of Chelsea district had other ideas and challenged the demolition efforts in court. 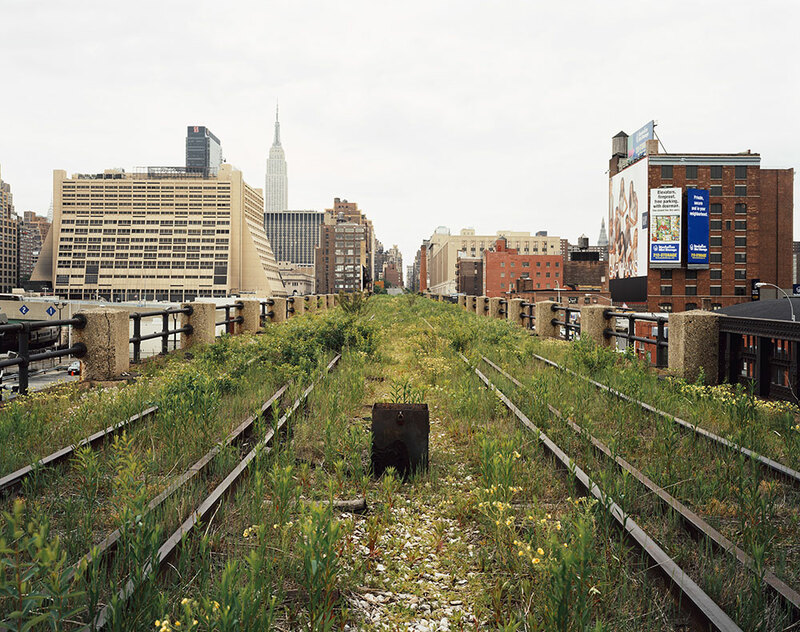 Eventually, in 1999, the Friends of the High Line was formed by residents in the neighbourhood to preserve it and transform it into a public space. A design led project, the Friends launched an open ideas competition. A design team was selected: James Corner Field Operations, a landscape architecture firm; Diller Scofidio + Renfro; and Piet Oudolf, planting designer. Very much in the Piet Udolf style, the High Line’s planting design was inspired by the self-seeded landscape that grew on the out-of-use elevated rail tracks during the 25 years after trains stopped running. The species of perennials, grasses, shrubs and trees were chosen for their hardiness, sustainability, and textural and colour variation, with a focus on native species. 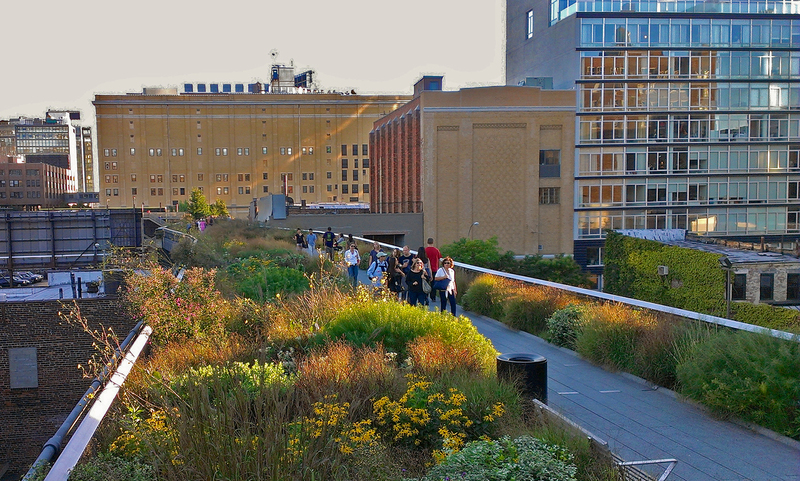 Many of the species that originally grew on the High Line’s rail bed are incorporated into the park’s landscape. Each section took two years to construct, the first of which was opened in 2009, the second two years later. It was not until 2014, after my visit, that the final and most northern section at the Rail Yards opened to the public. To see evidence of how successful this project has been and the enormous variety of uses it has, click here to go to their Flickr site. But be warned, there is a man in his pants looking very odd! Don’t worry, though – he’s a performance artist entertaining the visitors, not a real sleep walker! 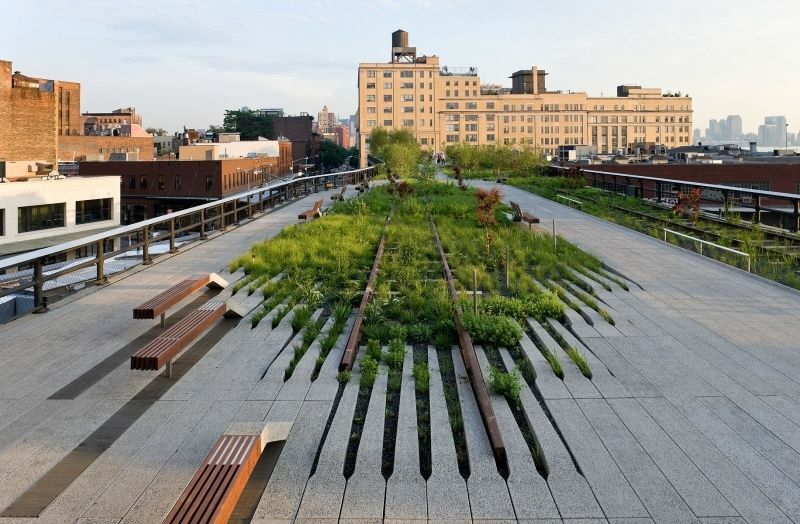 As a result of the wonderful regeneration of High Line in New York, there is now a rash of international projects aimed at repurposing transport infrastructure – The 606 in Chicago, The Underline in Miami, and the London’s Lowline. Many are also happening as a direct result of communities coming together and being core to the project. Peckham’s Coal Line is one such example, with crowdfunding being successfully utilised. Here, the plan is to make use of the disused Rickett coal sidings, which were decommissioned in the 1950s. 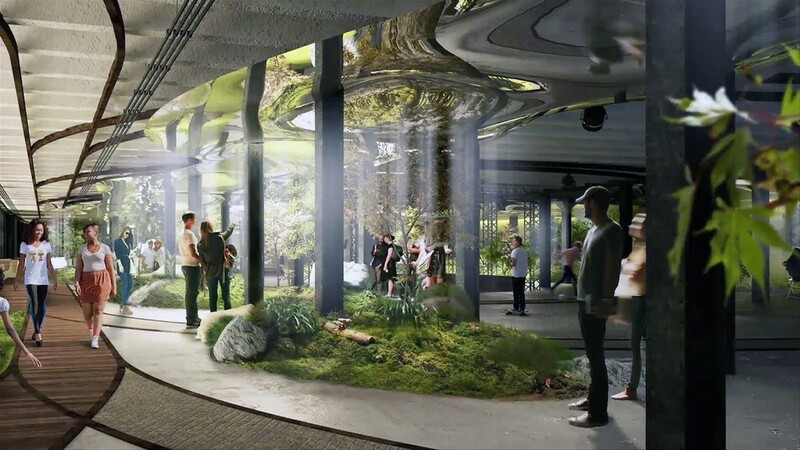 The 1km elevated urban park will cut through the heavily built up, ex-industrial area, to provide a green open space for visitors to enjoy in a variety of ways – cycling, walking, relaxing, enjoying nature, and playing. 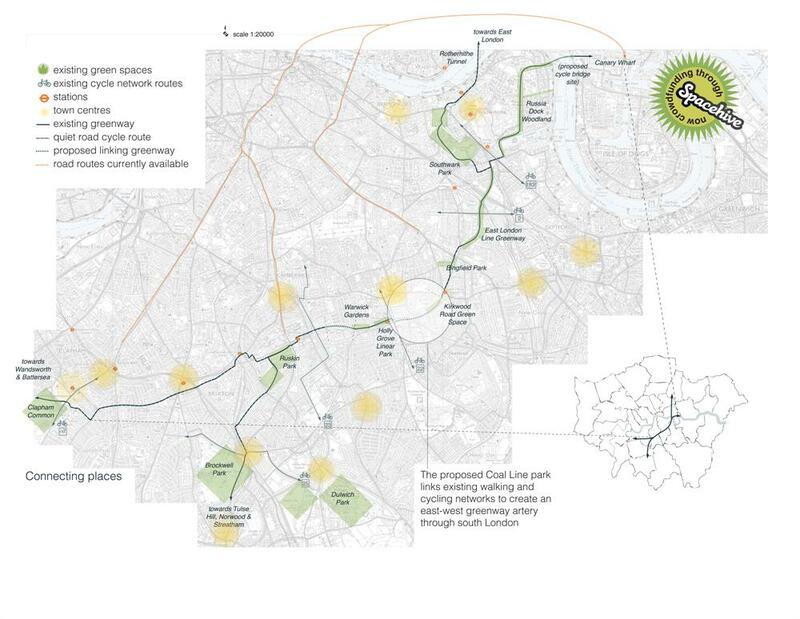 In stark contrast to these projects – which are focussed on regenerating, bringing communities together, and improving existing urban landscapes – the controversial Garden Bridge in London will create an entirely new structure, has not involved local communities, and has come under much criticism. I am surprised that such a respected designer as Dan Pearson, who will be doing the planting design, has put his name to it. 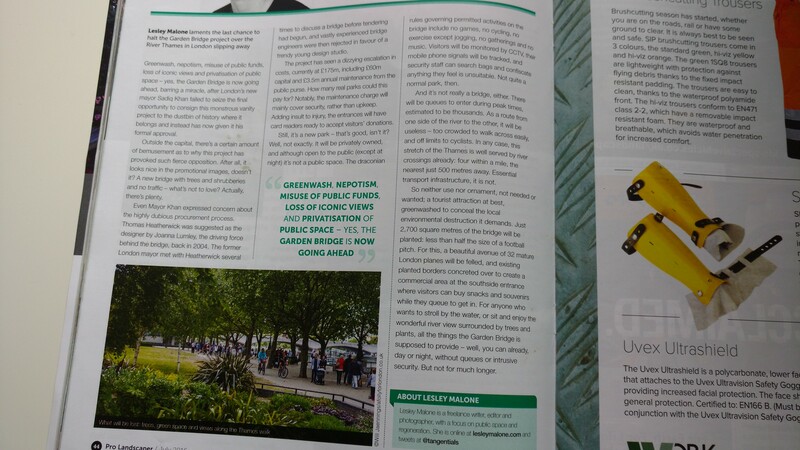 Lesley Malone wrote an article lamenting the Garden Bridge project, published in the July issue of Pro Landscaper. I agree with her that the Garden Bridge is a farce. Bidding procedures have not been fair and the end result is a tourist attraction rather than of benefit to the local community.